G'mar Hatima Tova is a phrase Jewish people around the world when they greet each other in a season called Yom Kippur. It means May you be sealed in the Book of Life. Before we go any further, I wish you a personal greeting like that, adding that my sincere wish is that you too will have your name inscribed in the Book of Life. This annual event is the holiest day of all in the Jewish calendar that is like the climax of a ten-day period known as The days of awe. In Hebrew, Yom means “day” and Kippur means “to atone” so it is it is also known as the Day of Atonement. What follows next is another special event called Sukkot, also known as the Feast of tabernacles. As it is with other Jewish feasts like Shavuot and Passover, they all have enormous prophetic significance to us. Whilst Yom Kippur is a solemn event, Sukkot is totally different, being a time of great rejoicing. I will touch firstly on G’mar Hatima Tova, then share a thought on Sukkot. Yom Kippur is a serious and solemn day, so people do not greet each other with a “Happy Yom Kippur”. The reason is that Jews believe that the Book of Life is opened on Rosh Hashanah, the Jewish New Year and is sealed at the end of Yom Kippur following the period of repentance. It is considered important because they believe that this determines their fate for the coming year. Traditionally, Jews believe that God decides who will be sealed in the Book of Life to live for another year after judging their deeds over the past year. Others simply use the day as a time to reflect on what they want to do differently in the coming year, just as we in the Western world make New Year resolutions that are often forgotten. Yom Kippur is “the tenth day of the seventh month” known as Tishrei and it is regarded as the “Sabbath of Sabbaths.” It is a period of time where Jews are required to take stock of their lives, to ask forgiveness from friends and family and to prepare to improve for the year to come. When Yom Kippur begins, Jews are prohibited from eating or drinking, bathing, anointing the body with oil, wearing leather shoes and having any sexual relations. During Yom Kippur (a 25-hour period) five synagogue services are conducted and a special memorial service is held for those who have died during the year. The Yom Kippur services contain many recitations of something called Vidui (confession) and a list of communal transgressions for which Jews ask for forgiveness. Jewish believers in Jesus spend the day in similar manner, but with a difference. They give thanks that their names are indeed written in the book of life, as are ours. We see mention of this in Exodus 32:32-33, Philippians 4:3, Revelation 3:5, 13:8, 17:8, 20:12-15, 21:17 and 22:19. Those dear brethren usually wear white garments on this day, symbolizing purity and the promise in Isaiah 1:18 saying that our sins would be as white as snow. On this day of atonement, we can think of Leviticus chapter sixteen, where God told Moses to instruct Aaron that he could not come into the holy place at any time he wanted because if he did, he would die. He laid down strict guidelines on how to make his approach. Aaron had to bathe first, put on his priestly garments, present sin and burnt offerings and bring two goats, one of which was for the Lord and the other was ʿazāʾzēl (the scapegoat). The concept was that after first making sure he had properly prepared himself and his house by making his own sin offerings, Aaron took the two goats to the door of the tent of meeting. Here he cast lots to choose which goat was to be sacrificed and which goat was to be the scapegoat. The Lord’s goat was sacrificed. The other was to be released into the wilderness. Aaron first laid his hands on this scapegoat and confessed the sins of the people over it. That way, their sins were transferred to that goat and when it was sent away, those sins were taken away with it. There is a saying that Jews tied a cloth that had been dipped in blood to the goat and looked carefully at the red stain so see what happened as was set free. If it turned white, it meant that God had accepted their sacrifice and their sins were taken away. I am not certain if this is true, but it “lines up” with what God has done for us because of Jesus. None of them can by any means redeem his brother, nor give to God a ransom for him. That word redeem is pādâ and it essentially means to transfer ownership of something from one person to another. The word ransom is kōper and it is really interesting. One meaning means young lion. Another meaning is a village. Other meanings relate to covering, a sum of money or even paying a bribe. OK, I think you can see some links here. Jesus is the lion of the tribe of Judah. He paid the price of the bribe to purchase our redemption and just as a village is somewhere someone lives, we are the temples of the Holy Spirit, He lives in us. We have been redeemed because someone made an atonement by offering a substitute and paying the price for it...by the priestly rituals of sprinkling the blood of the sacrificial animal to sin and defilement...the placing of hands on an innocent beast and transferring sin to it to be taken away never to be seen again. The whole meanings of the Jewish feasts now starts to mean something to a believer. 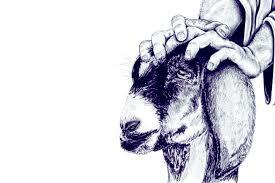 When he has finished purging the Shrine, the Tent of Meeting, and the altar, the live goat shall be brought forward. Aaron shall lay both his hands upon the head of the live goat and confess over it all the iniquities and transgressions of the Israelites, whatever their sins, putting them on the head of the goat; and it shall be sent off to the wilderness through a designated man. Thus the goat shall carry on it all their iniquities to an inaccessible region; and the goat shall be set free in the wilderness. And Aaron shall go into the Tent of Meeting, take off the linen vestments that he put on when he entered the Shrine, and leave them there. He shall bathe his body in water in the holy precinct and put on his vestments; then he shall come out and offer his burnt offering and the burnt offering of the people, making expiation for himself and for the people. The fat of the sin offering he shall turn into smoke on the altar. The bull of sin offering and the goat of sin offering whose blood was brought in to purge the Shrine shall be taken outside the camp; and their hides, flesh, and dung shall be consumed in fire. He who burned them shall wash his clothes and bathe his body in water; after that he may re-enter the camp. And this shall be to you a law for all time: In the seventh month, on the tenth day of the month, you shall practice self-denial; and you shall do no manner of work, neither the citizen nor the alien who resides among you. For on this day atonement shall be made for you to cleanse you of all your sins; you shall be clean before the Lord. It shall be a sabbath of complete rest for you, and you shall practice self-denial; it is a law for all time. The priest who has been anointed and ordained to serve as priest in place of his father shall make expiation. He shall put on the linen vestments, the sacral vestments. He shall purge the innermost Shrine; he shall purge the Tent of Meeting and the altar; and he shall make expiation for the priests and for all the people of the congregation. This shall be to you a law for all time: to make atonement for the Israelites for all their sins once a year. As you can see from this, it is a perpetual event...a law for all time as per the reference and this is what Jews commemorate every year. This does not mean that you and I must keep this observance and convert to Judaism. Not in the least. What I want to get across is that we can remember all these Jewish observances and look at them through the eye of biblical typology. As I have said, it symbolizes our Lord and the plan of salvation to everyone. Jesus did not annul the Law but fulfilled it. Jesus was and is still a Jew and basically everything He did on earth was in accord to Jewish manners and customs. As we have seen, only once per year was any Israelite permitted to enter the Holy of Holies in the Tabernacle or the Temple and to approach the Lord where His Spirit resided above the mercy seat and this person was the Kohen Gadol (the high priest). He only did this on the Day of Atonement. He had to go through a complex set of sacrifices to atone for his own sins first and then for the sins of the people. A scapegoat was led away, symbolically carrying the sins of the people and only after that, the High Priest could enter into the Holy of Holies to sprinkle blood on the Mercy seat. No one had the assurance that he would leave there alive. If he died there, no one else could possibly enter, so it is said that a rope was tied around his leg so that he could be pulled out if necessary. He supposedly did a little jig as he made his offering so that the people outside could hear the jingling of those bells embroidered around the hem of his garment. When he emerged, the high priest lifted his hands and pronounced the Aaronic blessing on the people. It was only then at that one time in the year when anyone could invoke the tetragammation Y-H-V-H that was the usually unutterable Name of God. In Hebrews chapters nine and ten, we can see how Jesus fulfilled everything that this Old Testament event signified. You and I can now come to God at any time we want. We can call Him Abba Father, but they could not even say His name. We can call Him friend as He calls us friends. Jesus is our brother, or our everything. Sukkot this year, 2018, was held on Sunday 23 September. It is actually a week-long Jewish holiday that comes five days after Yom Kippur. Sukkot celebrates the gathering of the harvest and commemorates the miraculous protection God provided for the children of Israel when they left Egypt. During Sukkot the Israelites make a foliage-covered booth (known as a sukkah) often on the roofs of their houses from four special species of vegetation. If possible, they do not put any roof coverings on the sukkah itself. It is the only one whose date does not seem to commemorate a historic event. The Torah refers to it by two names: Chag HaAsif (“the Festival of Ingathering,” or “Harvest Festival”) and Chag HaSukkot (“Festival of Booths”). In Israel, crops grow in the winter and are ready for harvest in the late spring. Some of them remain out in the field to dry for a few months and are only ready for harvest in early Autumn. During this time, the people thank God for His blessings of the harvest. Chag HaSukkot commemorates the temporary dwellings God made to shelter the Israelites on their way out of Egypt. Some people say this refers to the clouds of glory that shielded them from the sun, while others say it refers to the tents in which they dwelled for their 40-year trek through the Sinai desert. Interestingly, this is the only celebration in which God actually commanded the people to be joyful. ‘And you shall observe it as a festival to יהוה for seven days in the year—a law forever in your generations. Observe it in the seventh month. “I thank you, Adonai, because, although you were angry at me, your anger is now turned away; and you are comforting me. “See! God is my salvation. Then you will joyfully draw water from the springs of salvation. On that day you will say, “Give thanks to Adonai! Call on his name! Make his deeds known among the peoples, declare how exalted is his name. Sing to Adonai, for he has triumphed—this is being made known throughout the earth. On the last and greatest day of the feast, Jesus stood and cried out, “If anyone is thirsty, let him come to Me and drink. He who believes in Me, as the Scripture has said, out of his heart shall flow rivers of living water.” By this He spoke of the Spirit, whom those who believe in Him would receive. For the Holy Spirit was not yet given, because Jesus was not yet glorified. Zechariah says that in the millennium, all nations will come up to Jerusalem for the Feast of Tabernacles . There are other feasts I have not yet covered and they are powerful! Shavuot is one, but I shall not elaborate on this now. Perhaps you can see how important they are for us. Even if we are not Jewish in the literal sense, everything we see in their manners and customs, laws, feasts and observances has some kind of relationship to what Jesus is and did for us. In closing therefore, I exhort you to dig deeper into the Jewish side of our inheritance. It is simply amazing how detailed it all is.